Does my child need vaccines? According to the National Public Health Information Coalition (NPHIC), vaccines give parents the power to protect their children from serious diseases. One of the most important things a parent can do to protect their child’s health is getting their child vaccinated according to the recommended immunization schedule. Ask your doctor what shots your child needs and at what age your child should get them. Follow your doctor’s schedule. When your child is getting one shot, make an appointment for the next. Don’t miss your child’s doctor visit. If you have to cancel, set up another one. 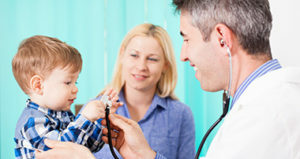 Talk to your doctor about your specific questions and concerns regarding your child’s health, and use these guidelines, along with the advice of your doctor, to help your child stay healthy. Vaccines are the safest and most cost-effective way to prevent several diseases. They not only protect vaccinated individuals but also help protect entire communities by preventing and reducing the spread of infectious diseases. Currently, the U.S. has the safest vaccine supply in its history. Our long-standing vaccine safety system ensures vaccines are as safe as possible. What happens after the shot? Your child may run a fever or have swelling in the shot location after getting a shot. Check with your doctor about giving your child over-the-counter pain medication. And if you do, follow the directions carefully. Vaccines are recommended throughout our lives. Following the recommended schedule offers the best protection. Ask your doctor for a screening and immunization record to keep track of your child’s tests and shots. Keep this record in a safe place. Child care providers and schools will ask for it. Be sure to bring the record to every doctor visit.